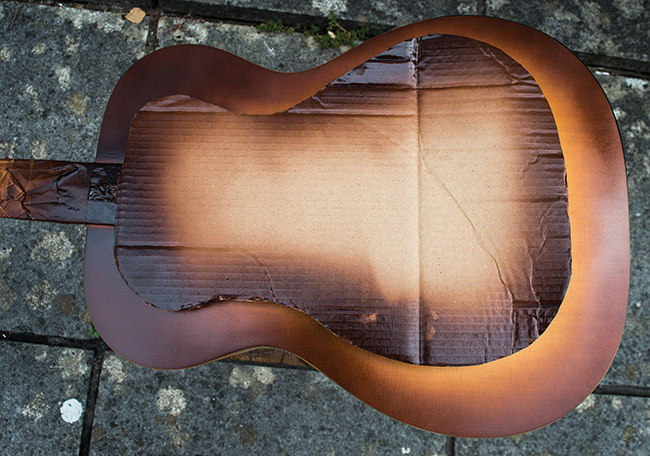 Finishing up our Martin Guitar Kit inevitably means applying the finish, and while the actual spraying part requires more diligence than skill per se, the key to achieving a pro quality finish is preparation – most of the work should already done before you even reach for the spray cans. 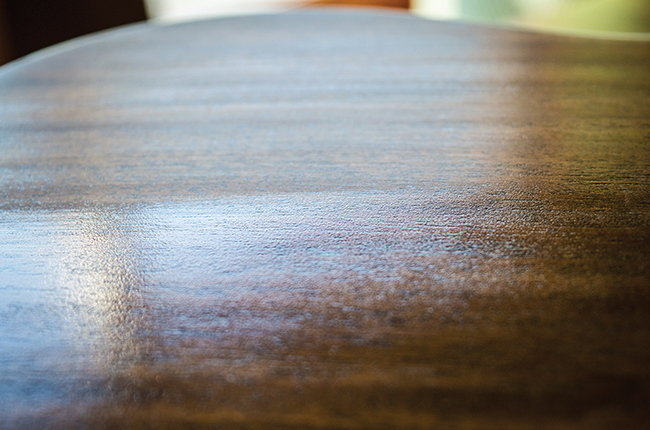 It quickly becomes apparent that merely sanding the mahogany back will be insufficient to achieve a smooth surface: the grain is extremely open and somewhat ‘furry’ in places. I wipe the surface with a damp cloth to raise the grain, allow the wood to dry, and then sand. After a few damping and sanding cycles, the surface feels okay; and the sides get the same treatment. The neck is carved from much denser mahogany, so straight sanding with 220 grit is all that’s needed. Before applying the grain filler, I tape over the fingerboard and the top binding, and cover the soundboard with greaseproof paper to protect them from becoming stained and to make the cleanup easier. Colron Teak grain filler is mixed with powdered burnt umber pigment and diluted to a double-cream consistency. 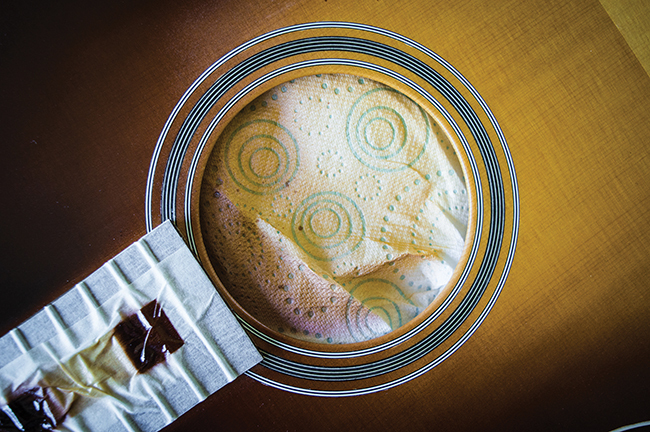 Pressing the grain filler into the mahogany is a messy job and sanding it all smooth again always seems to take an age – especially when a guitar requires two or more applications, as this does. But done right, you should end up with a very smooth surface with filler packing the open pores. In this case, the dark filler accentuates the grain and the pale mahogany acquires a far richer colour. 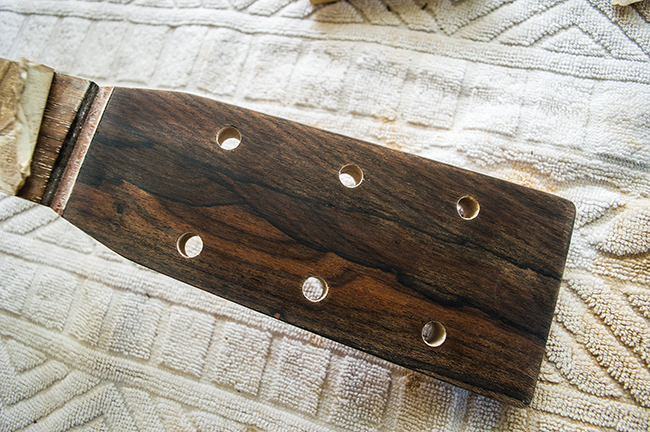 However, I decide to try something different for the ziricote headstock veneer, because the pores are extremely open, it’s slightly flaky, and I don’t want to obscure the grain pattern. For the first time, I try using Super Glue as a grain filler, applying a few small drops at a time and quickly spreading it over the surface before it dries. The fumes are nasty, so I’d suggest working outdoors, using a breathing mask – or both. The water-thin Super Glue wicks into the pores and sets very hard. I sand it back with 320 grit paper on a small sanding block and, after a couple of applications, I’m left with a very flat and smooth surface. Better still, the grain pattern is enhanced and there’s more colour variation in the ziricote than was previously apparent. This works so well, I use Super Glue on the rosewood heel cap, too. The front is covered once again and fresh plastic edging tape is applied to the binding. 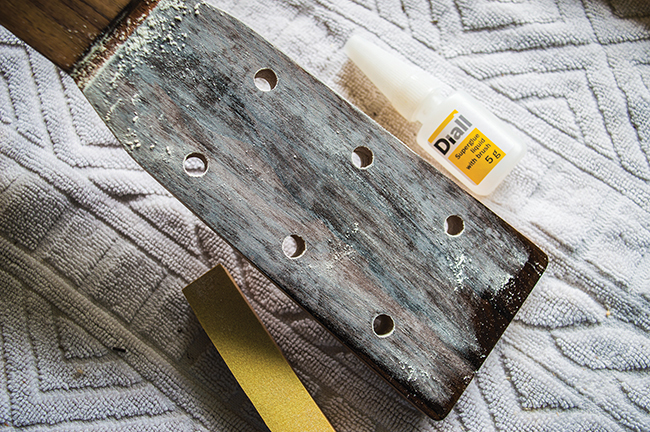 With the fingerboard also masked off, I ensure that all the filler dust has been removed from the body and neck, then I lay down three coats of Manchester Guitar Tech’s Cellulose Sanding Sealer. This is left overnight before being sanded smooth: I do most of the work with 240 grit paper, and then switch to 0000-grade wire wool. First I go with the grain, then across it and I finish up with figure-of-eight movements. 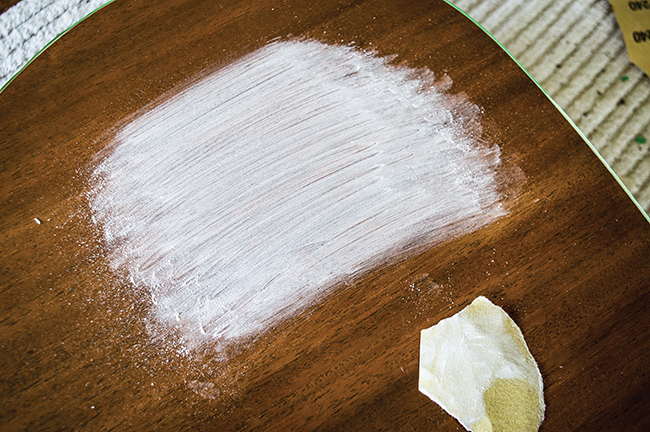 If you use wire wool, it’s important to remove all trace of it before spraying, but it really is very effective for creating a smooth surface ready for spraying. 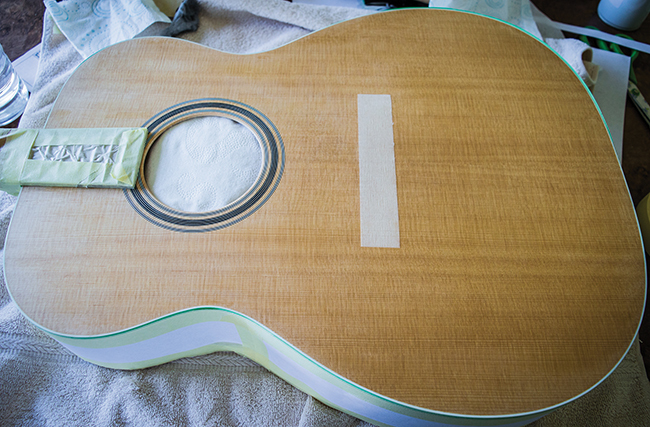 I apply two coats of Manchester Guitar Tech’s Clear Medium Brown Lacquer, 30 minutes apart, and after an hour, I remove the tape from the back binding and the two strips of plastic at the tail. 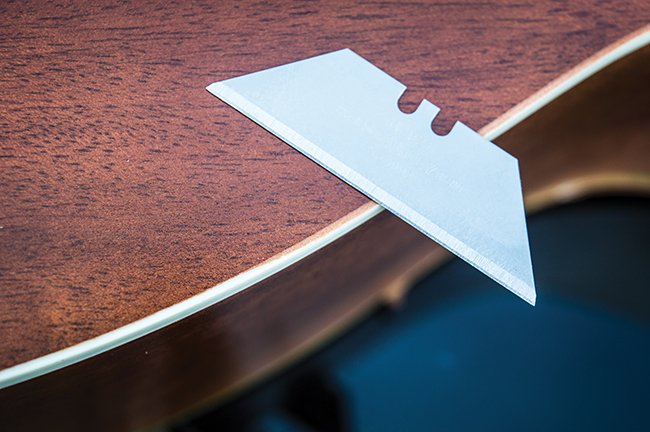 A fresh utility knife blade is used to scrape the exposed edge and reveal the clear off-white binding. I also use the blade and some 320-grit paper to soften the binding corner. Next, I spray two coats of clear lacquer and after a few hours, I remove the protective paper and edging tape from the front binding. Before spraying the front, we need to talk about the bridge location. The bridge must be stuck to the body very securely, and that means wood against wood, not wood against lacquer. Acoustic builders have two ways to work around this problem. The first is to spray, cut and polish the front, and then mark the bridge location to scrape away the finish. The second is to determine the bridge location prior to spraying, and mask off the area with tape before you start. I prefer the latter. Getting the bridge position correct is critical, because it determines the string path and whether the guitar will play in tune. Martin’s instructions are pretty clear and they recommend that the centre point of the saddle slot directly in front of the first (high E) string pin should be the scale length plus 0.1 inches. To find this position, I tape a 36-inch steel ruler onto the fretboard with the starting point exactly in line with where the nut’s leading edge will end up. 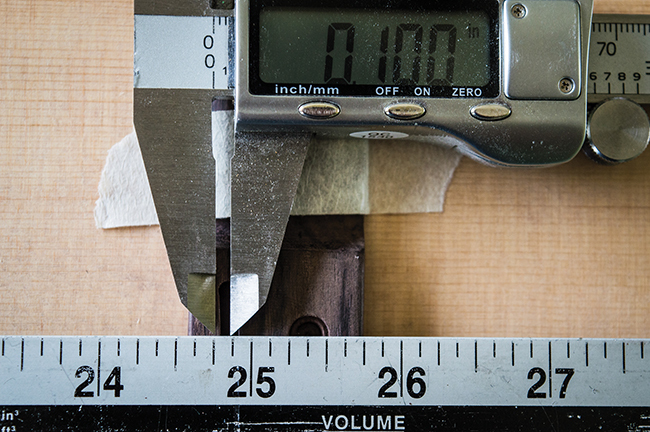 I read 12.38-inch at the 12th fret, so the centre of the saddle slot has to be 24.75 inches plus 0.1 inches for compensation. With this point established, the bridge is taped to the top at the treble side. Now I have to ensure the bridge is square to the neck – and I once came a cropper doing this. Standard procedure is to measure from the 14th fret to the front corners of the bridge, making sure that the distance is identical on both sides. Having successfully positioned the bridges on my first two acoustic builds, my third acoustic ended up with the bridge too far towards the bass side. My measurements were correct, but it turned out the post holes had been drilled off-centre. This time, I measure from the 14th fret to the front edge of the bridge on both sides and I double-check that the pin holes are properly centred. Once I’m happy with everything, I secure the bridge in place with a bridge clamp and double-check all the measurements. Low-tack masking tape is placed all around the bridge; the bridge is then removed, and I cut out a piece of masking tape that is exactly the same size as the bridge – minus about 0.5mm all the way around. 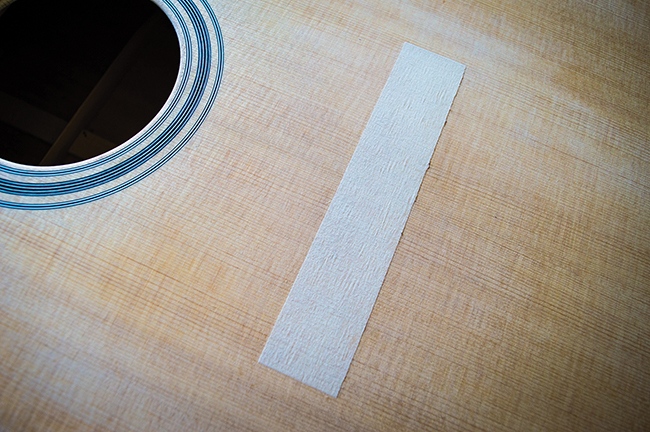 After placing it in position on the spruce, I remove the guide tape. 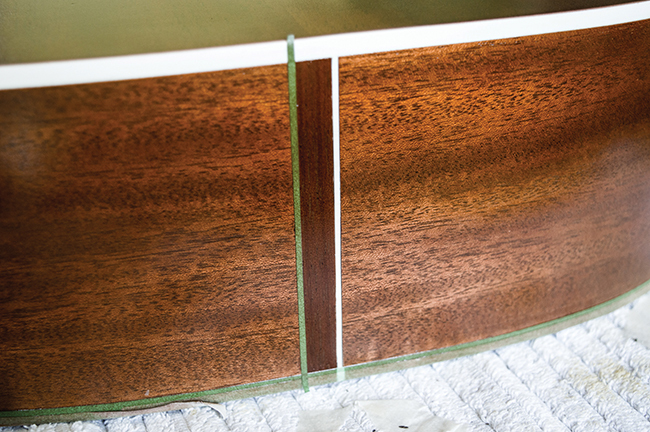 Once the finishing process is complete, I’ll peel it off to reveal perfectly flat bare wood. After masking off the back, sides and neck (a fairly lengthy procedure), I steam out a few dents in the spruce and spray two coats of cellulose sanding sealer about 30 minutes apart. I leave it to dry for a few hours, then I flatten the sanding sealer back with 320 grit paper – only to discover I need at least two more coats. 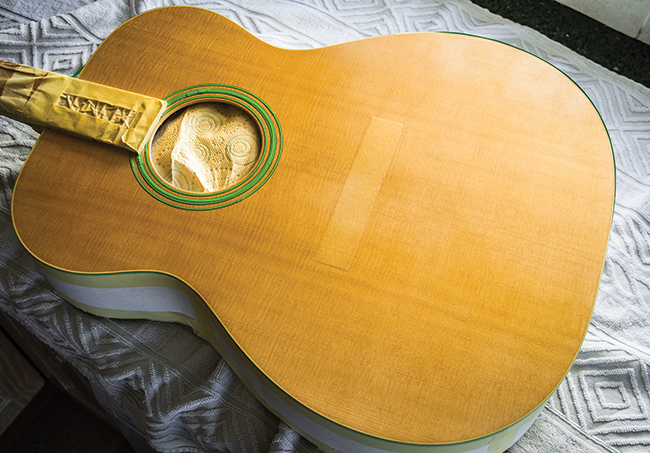 Spruce is quite porous, so it seems to soak up regular lacquer like a sponge. There are also areas of open grain, as well as quite tight grain. The bottom line is that sanding sealer isn’t a stage you can skip if you want a flat and smoothly finished top. After four coats of sealer, a lot of sanding and rubbing down with wire wool, the spruce is ready for its top coats. It’s been my intention all along to do a sunburst finish. Even after seeing the perfectly smooth and cross-silked spruce after the base coats, I decide to press ahead. I must be a glutton for punishment, because I’m letting myself in for a load more work. The first task is to mask off the rosette rings, so I measure the width of the outer and inner rings – 2.5mm/5mm/2.5mm – and head to my local car-paints shop to buy edging tape. Frustratingly, they only have two sizes in stock – 4mm and 6mm – but I buy them both anyway. Lengths of the 4mm tape are laid out as straight as possible along a kitchen surface offcut and I trim the edges to bring it closer to 2.5mm. After attempting this with a ruler and a utility-knife blade, I revert to cutting the tape freehand. For the wider centre band, I cut a centre line straight through the 6mm tape and mask off the band in two passes with an overlap in the middle. 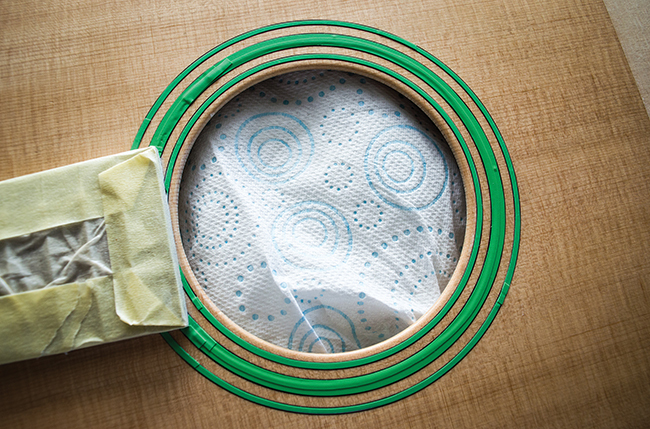 The only tricky thing about masking this rosette is cutting the angles where the rings disappear beneath the fingerboard. Plastic edging tape is way more pliable than regular masking tape, so it’s far better suited to going around curves. It also has just the right amount of tackiness, and you get much cleaner and sharper lines when you’re covering binding, inlays and so forth. 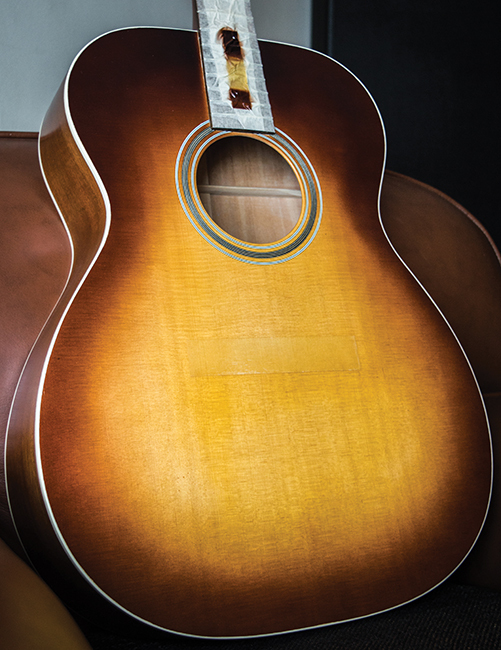 With acoustic sunbursts – aka ‘shaded tops’ – it’s necessary to consider both the colour and shape. 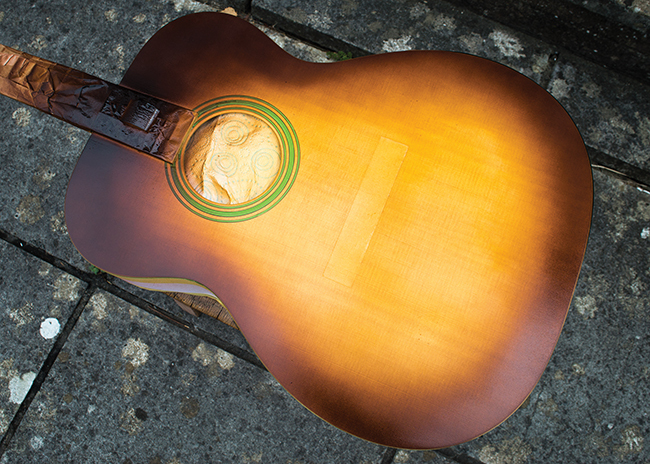 Regarding the spray patterns, Martin sunbursts seem to follow the outer edge of the body, whereas Gibsons tend to have a teardrop shape with more shading on the upper bout. You can see all sorts of colours on vintage acoustics. At one extreme, there’s bright yellow with a soft cherry brown around the edges. At the other, there’s deep, orangey amber with tobacco brown or even black edges. All along, I’ve wanted a look that’s more Gibson than Martin, and I decide to shoot for an amber centre with reddish-brown edges. I follow my usual modus operandi of looking at pictures online, sending them to Steve Robinson and asking him how to do it. He recommends tinted clear followed by medium-brown clear for the ‘burst. The tinted clear is preferred to amber, because it’s less yellow. When spraying, I go side to side, in straight overlapping lines, then along the length and finally crossways at 45 degrees. Having completed those passes, I consider that one coat, set the timer on my phone for 30 minutes and busy myself with something else while I’m waiting. When the alarm goes off, I don my breathing mask (as always) and apply a second coat. By that stage, I feel the colour is even enough and sufficiently intense to move onto the ’burst. Since I have only attempted a handful of sunburst finishes in the past, I decide to play it safe on this occasion and make a cardboard shield. The shield is cut to follow the body shape, with a 5cm gap around the edges. It’s positioned over the top, with sticky spacers placed on the fingerboard and the bridge tape. The medium-brown clear is sprayed with the aerosol can held over the centre and directed outwards. I spray light passes, keeping the aerosol moving constantly to prevent localised build-up of lacquer. Keeping the shield a couple of centimetres above the body enables you to achieve a relatively soft transition line between the colours. Even so, once the outer edges are more or less the right shade, I still need to bring the ’burst closer to the centre. The shield is removed from the top and I hold it in my left hand as I spray with my right. 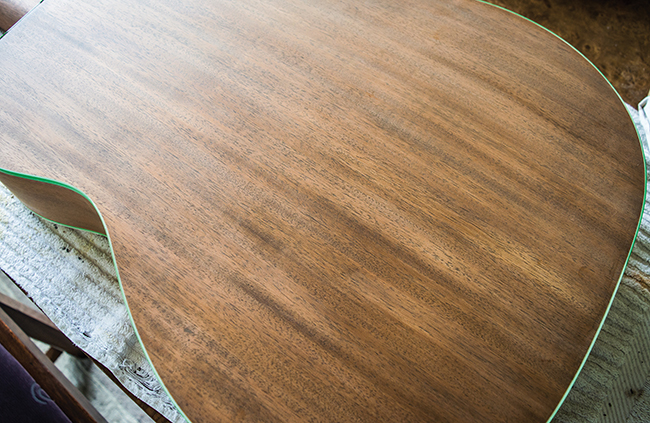 This allows me to expand the outer edge, while protecting the centre from stray lacquer. For the most part, it works, but I still end up with a few unwanted dark spots. But it all adds to the ‘vintage vibe’ and you have to look fairly closely to see them. The medium brown gets darker as its thickness increases: and the darker it gets, the more I like it. Eventually, I end up with slightly more depth of colour around the upper bout and a sunburst pattern that’s somewhere between a Gibson and a Martin. While the finish is still fairly soft, I remove the rosette tape, scrape the top edge of the binding with a fresh utility blade and remove all the masking from the neck and body. It’s far from perfect, but I’m fairly happy with the look and I particularly like the way the rosette pops out of the ’burst. Hopefully, it will look better after some light tint clear and gloss coats, followed by a good polish. All being well, I should very soon be gluing the bridge on and stringing this guitar up for the first time. Thanks to Steve Robinson of manchesterguitartech.co.uk for his fine lacquer and sage guitar-spraying advice.